I have a new team member in my gym, Amy Dudley RKC ! She was in St. Paul for the Sept. cert and killed it. 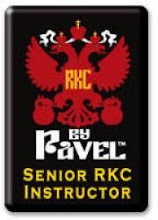 She is a welcome addition to the RKC family and is a breath of fresh air in more ways than one to my facility. She will be doing one on one training and classes for Better Bodies of Medina. Her class times are Tuesday and Thursday mornings at 9:15. Shoot me an email for her information. Kill it she did. She represented at the Team Technique Competition and many had her picked as the total winner.She was strong the whole way through.Nice work both of you.